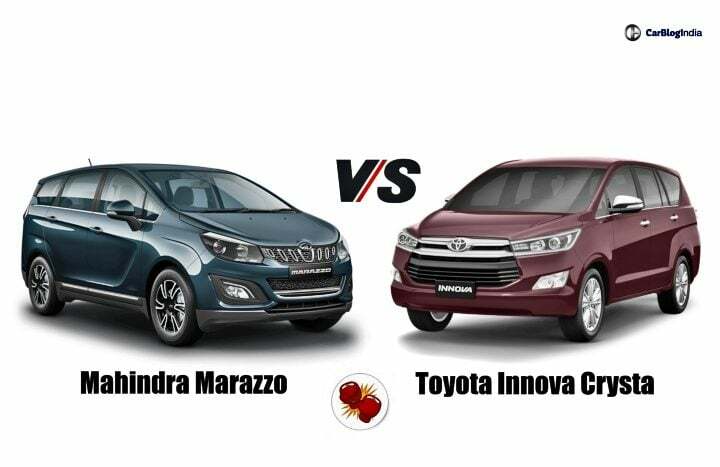 Mahindra Marazzo Vs Toyota Innova Crysta- Which One Should You Buy? Mahindra Marazzo Vs Toyota Innova Crysta; Which one out of these should be your pick if you are looking to buy a premium 7-seater MPV? The Toyota Innova Crysta need no introduction. It has been dominating the segment of premium MPVs with its superior reliability, comforts and features. That said, the new Mahindra Marazzo is a lot cheaper to own, has almost the same amount of features and in-fact, on paper, promises to offer more space on the inside. Are you also confused between these two family MPVs? Can’t decide which one in the better options? Well, to help you out we have prepared this article where we bring you all the specification based information of these two cars and compares them with each other. Read along and decide! Do let us know in the comment section below which one suits your need better. The Mahindra Marazzo retails in India in a total of four variants. The base variant, as you can see in the table above, costs INR 9.9 lakhs. On the other than, the range-topping M8 variant retails at a price of INR 13.90 Lakhs. The Mahindra Marazzo, at the moment is only available with a diesel derivative. In contrast, the Toyota Innova Crysta retails in a total of 6 different variants for the petrol version. While the diesel version has a total of 8 variants at its disposal. Unlike the Marazzo, the Innova Crysta is available with a choice of one petrol and two diesel engines. The base price for the petrol trim stands at INR 14.65 lakhs. While the range-topping petrol trim goes for INR 20.70 lakhs. The base diesel trim retail at INR 15.77 lakhs. Top-end diesel trim with the 2.8-litre oil-burner goes for 22.01 lakhs. As mentioned before, the Marazzo is only available in India with a diesel engine. This engine is a 1.5-litre unit which is developed in-house by Mahindra with expertise from MANA. This engine belts out a power of 120 BHp along with 300 Nm of peak torque. Mahindra has confirmed that it is going to introduce a petrol engine in this MPV next year. The aforementioned engine will meet the upcoming BS-VI emission norms. And with that, the automaker will also introduce an automatic gearbox in this MPV’s model lineup as well. Now coming to the Toyota Innova Crysta, as mentioned before, it comes with one petrol and two diesel engine options. The petrol derivative gets a 2.7-litre which is capable of producing 163 BHp along with 245 Nm of peak torque. It is available with both a 5-speed manual gearbox as well as a 6-speed automatic torque converter unit. Coming to the diesel engine line-up of the Innova. The smaller capacity engine is a 2.4-litre unit. This is capable of producing 147 BHp along with 343 Nm of peak torque. This engine is available only with a 5-speed manual gearbox. The other diesel engine in this MPV’s portfolio is a 2.8-litre unit. This engine is capable of producing 171 BHp along with 360 Nm of peak torque. It is available only with a 6-speed automatic transmission. The Mahindra Marazzo’s 1.5-litre diesel engine promises an ARAI certified fuel-efficiency figure of 17.5 km/l. In real-world conditions, expect the MPV to deliver close to 14-15 km/l. Now coming to the Innova Crysta, this premium MPV’s 2.7-litre petrol engine promises a fuel-efficiency figure of 11 km/l. The 2.8-litre diesel engine also promises a mileage figure of 11 km/l. While the 2.4-litre diesel engine promises a mileage figure of 13 km/l.. Real-world figures might be slightly less than the above-mentioned numbers. The Mahindra Marazzo MPV measures 4,585 mm in length, 1,866 mm in width and 1,774 mm in height. This MPV sports a wheelbase of 2,760 mm along with a boot capacity of 190-litres with all the three rows up. In comparison, the Toyota Innova Crysta boast of a length of 4,735 mm, a width of 1,830 mm and a height of 1,795 mm. It comes with a wheelbase of 2,750 mm and the boot space stands at 300-liters even with all the three rows intact. Now coming to the Toyota Innova Crysta, it is priced at a very premium price range and hence tends to offer a little bit more than the Marazzo.